The right product will be effective, nonantibiotic, easy to use, and well tolerated. It must also be able to sustain decolonization with continued use by the patient as well as be appropriate for use by those in contact with the patient. 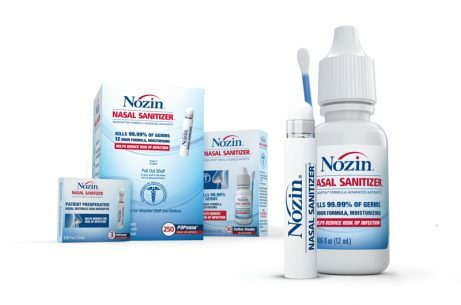 Nozin IP Programs leverage the versatile profile and proven effectiveness of Nozin® Nasal Sanitizer® antiseptic. Nasal decolonization has become an important tool in providing the best possible care. Research supports wider adoption of nasal decolonization for infection control. As the table below shows, Nozin offers the most suitable proﬁle. 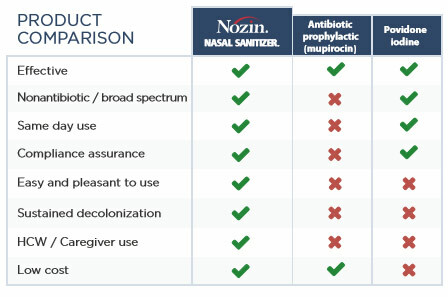 In a comparison of products, Nozin® Nasal Sanitizer® allows for wider applicability. Universal, sustained nasal decolonization is now possible without some of the familiar constraints of antibiotics or iodine. Nozin® Infection Prevention Programs help safeguard your most vulnerable patients from the risks of MRSA colonization. Nasal decolonization for Surgery, ICU, MRSA CP made safer and easier.